Olea europaea (olive) oil*, Butyrospermum parkii (shea) butter*, Cera alba (beeswax)*, Linum usitatissimum (harakeke flax) oil*, Cocos nucifera (coconut) oil*, Oenothera biennis (evening primrose) oil*, aqua (water), silica, Lavendula officinalis (lavender) oil, Theobroma cacao (cacao) butter, Vitis vinifera (Vinanza® Grape grape seed) extract, tocopherol (Vitamin E), Matricaria chamomilla (blue chamomile flower) extract, Hibiscus sabdariffa (hibiscus flower) extract, Naticide® (natural preservative). * Certified organic ingredient. Colour and clarity may vary between product due to pure organic content. 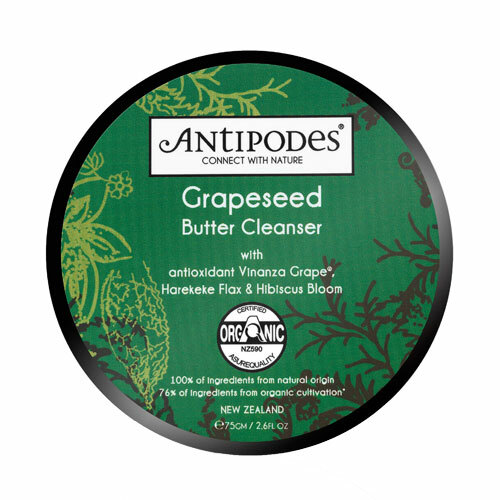 Below are reviews of Antipodes Organic Grapeseed Butter Cleanser - 75g by bodykind customers. If you have tried this product we'd love to hear what you think so please leave a review. 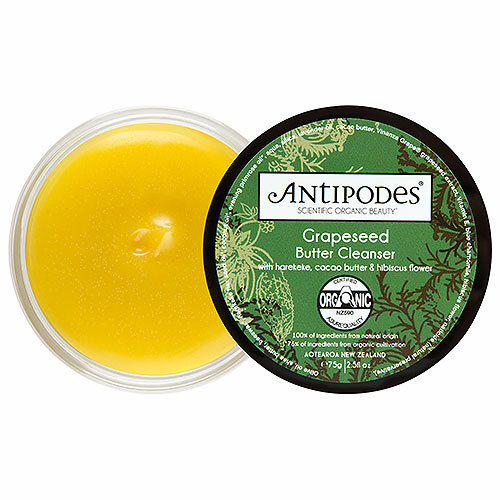 Soothing lavender and blue chamomile partner to help calm sensitive skin as well as refresh and cleanse, while hibiscus bloom has gentle exfoliating action.